Crif Dogs is not your average NY Hot Dog eatery. It's not a cart on the street corner with dogs sitting in "dirty water" (for those who are not aware I do not actually mean they use dirty water, it is just the color the water gets after cooking hot dogs all day long). It's also not a place where you are going to get 2 grill top cooked dogs and a drink for $5, like some other famous NYC hot dog ioints. Instead it is a place where you are able to get a hot dog that most people have had before, a Deep Fried dog. Yes I did just say a deep fried hot dog and that's not all, most of them are wrapped in Bacon or Taylor Ham. Now I bet after reading deep fried hot dog many of you just said "eww, gross". To those who did we ask, how often have you had something deep fried and it was bad? 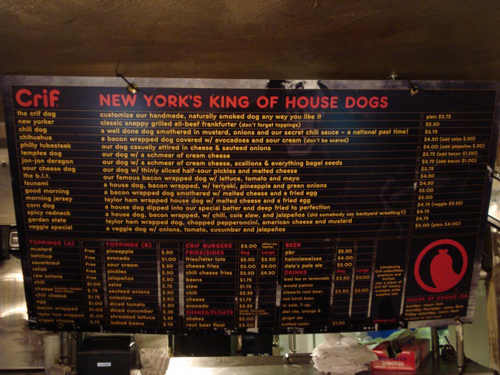 Crif Dogs has two locations, the original is located at 113 St. Marks Place in Manhattan, NY. Their second location is in Williamsburg, Brooklyn located right off the Bedford L Train stop at 555 Driggs Ave. Both locations offer the same exact lunch/dinner menus and food quality so choose which ever location is closest to you and head out. The Brooklyn location offers breakfast sandwiches in the morning. They have an array of hot dog combinations, here are just a few of the ones that stick out. We went here with a group of people most of them were Crif Dog virgins. A few of them were a bit intimidated by the menu and decided to take it easy and just get a classic Crif dog wrapped in bacon. From our past experience these delicious, pork wrapped dogs are very good. Crif Dogs also makes some killer tots and waffle fries, but be aware when your order a large they give you a massive amount. Garden State - is a taylor ham wrapped house dog, chopped pepperoncini peppers & American cheese. The hog dog itself has a great crunch to it thanks to the deep fried bath and layer of taylor ham. The American cheese helps to give it a nice smooth taste, but it is actually the peppers that really make this dog. The pepperoncinis help break up the salty pork flavor with a sweet and slightly spicy kick. We highly recommend this one. John-John Deragon - We first have to note that our order was modified a bit from the original. The original John-John is a crif dog with a schmear of cream cheese, scallions & everything bagel seeds. This was what we were going to order until speaking with the guy working at the counter. He said the John-John was his favorite dog but he likes to get it with hot sauce. As soon as he said hot sauce we were sold. We have had the original in the past and it is very good. Again there is a perfect crunch to the dog thanks to the fryer. The cream cheese is a strange choice but in the end is a perfect compliment to the dog. Topped of with scallions and everything bagel seeds you feel as if your eating a breakfast sandwich. Our version had the added component of hot sauce, and it was awesome. We love hot sauce and it made us wonder why we had not thought of this sooner, in fact we even regretted not adding hot sauce to everything else we got. Oh well there is always next time, but this dog with hot sauce is just amazing. We feel it is important to mention that Crif Dogs does offer a vegetarian dog called the veggie special. It is a veggie dog w/ onions, tomato, cucumber & jalapenos. It is pretty good, says our vegetarian friend. Crif Dogs also offers a burger which we have not had but will have to try one of these days. Crif Dogs is a definite Should Eat. If you like Hot Dogs you will love this place. Don't be afraid of the crazy toppings, they would not be on the menu if they didn't taste good. We promise after you visit Crif Dogs once, you will be hooked.